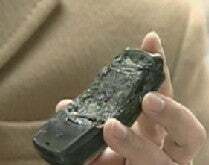 A Korean man was apparently killed by his LG cellphone today. He was carrying the phone in his left shirt pocket when it exploded, puncturing his heart and lungs. It happened in the North Chungcheong Province of Korea as the man was working on a construction site. He was found dead by one of his coworkers. "When I was going up the stony hill to set dynamite, I found a man lying down beside an electronic shovel," said his colleague. "He was already bleeding from the nose. He had a mobile phone with a melted battery in his left shirt pocket. His shirt had soot on it in the shape of the phone."